REYKJAVÍK (Rixstep) — FBI agents landed in Reykjavík without prior notification in an attempt to investigate WikiLeaks operations in the country, but Home Secretary Ögmundur Jónasson found out about the visit and forced them to leave the country, with the Icelandic government then issuing a formal protest to US authorities, according to Islandsbloggen. The hunt for WikiLeaks by the US has on several occasions involved private individuals and companies on Iceland. 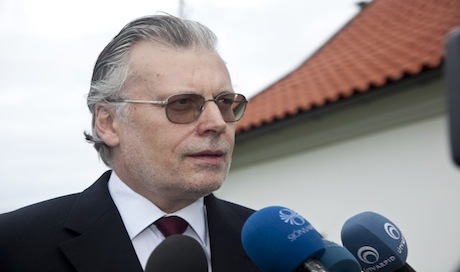 Authorities in the US have for example succeeded in obtaining account information from Twitter on parliamentarian Birgitta Jónsdóttir. Jónsdóttir today refuses to travel to the US out of fear of being arrested for her connections with WikiLeaks. Birgitta Jónsdóttir is also one of the people behind a new piece of Icelandic media legislation which will make the country a bastion for freedom of speech and source protection. The law proposal is still a long way from being completed and can still take years before it’s ratified by the Icelandic parliament. This past summer the credit card company Valitor was forced by a court decision to again offer the opportunity to donate to WikiLeaks. Their payment channel had previously been closed off after massive pressure was brought to bear by international credit card companies which in turn was fueled by US efforts to stop the organisation. An appeal of the ruling is expected. 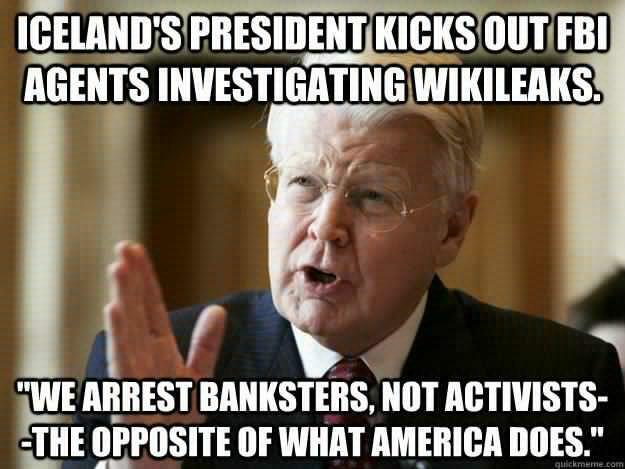 The Icelandic government have already protested against the activities of the US in Reykjavík. It’s been found, for example, that the US embassy there is monitoring people who enter the immediate area, and they also attempt to thwart people taking pictures of their building, this despite it being perfectly legal. A private plane landed at the Reykjavík airport in August 2011. Onboard were FBI agents who’d flown directly to Iceland from the US. Their mission was to investigate WikiLeaks operations in the country as part of a larger investigation of the whistleblower organisation. The FBI agents contacted the head of the national Icelandic police and the head prosecutor in an effort to gain access to all available information on WikiLeaks. Home Secretary Ögmundur Jónasson learned of the visit and summoned the FBI agents. They were told that the Icelandic government would not permit a foreign power running their own investigations in the country. Jónasson admonished the FBI agents to return to the US. Foreign minister Össur Skarphéðinsson was given the task, after a special meeting of the cabinet, to formally protest against the behaviour of the US. The story was revealed in an Icelandic national broadcaster RUV report on 30 January 2013 by WikiLeaks spokesperson Kristinn Hrafnsson. Hrafnsson explains. Read more about surveillance by the US embassy in Reykjavík here.